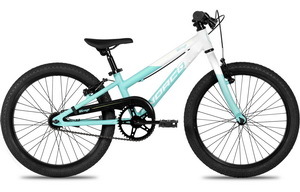 Norco Mirage - 20" wheel kid's bike. The training wheels are long gone and your kids are riding with confidence. With options like gears and disc brakes, your kids will be riding circles around you in no time with these rides. We even offer junior urban bikes. Go where you want—they can keep up now.